Hannah and Steve are form UK and chose Mykonos for their destination wedding in Greece. We had never been in Mykonos and we decided to book a small, typical white house apartment close to the wedding venue of the wedding. We were far from the busy Mykonos town, a sort of little no where of this magical, dry, colorful island. So, we discovered the pleasure to walk with nothing around, where the dark is dark and the sea has the most amazing blue we have ever seen. That’s how we first arrived tour wedding venue. 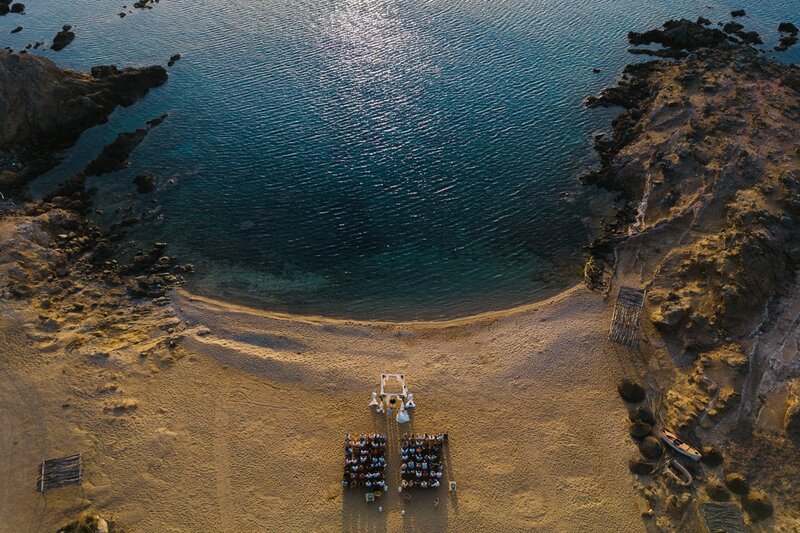 Hannah and Steve had their beach wedding ceremony at the charming Alemagou on the Ftelia beach, the same amazing view we had from our little greek house. Sunset time, the warm and the wind, the feet in the sand, Mediterranean smells and the happiness of this lovely couple. Please take us back to Mykonos! A big thank you for the help and the kindness also to Natasa Rizou who runs Mykonos Best and who helped our bride and groom to organize this dreamy beach wedding. She is called the queen of Mykonos and she is for sure the queen of hospitality.